If we are looking for any signs of hope in the long-running tragedy of the people of Iraq, suffering from the rapaciousness of outside powers and the tyranny of sectarian party rule, we should pay close attention to recent events in Northern Iraq and the dramatic rescue of thousands of Yezidi Kurds and others from on Mount Sinjar, where they had fled to escape the onslaught of ISIS, by YPG (People’s Defence Forces) guerrillas from Syria, who fought to open a narrow corridor through the desert from Sinjar and out of Iraq into the YPG controlled area of northern Syria. Why did YPG need to go to Sinjar? It was necessary because the Yezidis had fled after at the culmination of a process lasting two months in which the Iraqi army and KDP forces had abandoned first the city of Mosul and then the towns and villages in the adjacent area of the Plain of Mosul /Nineveh to “ISIS”. First the Iraqi army fled Mosul, and the important Kurdish city of Kirkuk, and the explanation was said to be poor morale. But regional news programmes soon showed Baathist leaders popping up in Erbil TV studios doing interviews, and some Iraqi army generals who abandoned their posts were helicoptered off to Erbil in the Kurdistan Regional Government area (not back to Baghdad), and it seemed clear that there was some sort of understanding between the KDP and “ISIS” that ISIS and their allies would not enter obviously Kurdish areas, while the local KDP forces would not attempt to stop the taking at least the west side of Mosul with its mainly Arab population, well-known as a stronghold of Baathism. I thought East Mosul would be defended by the KDP, since it was more mixed, contained the university area, had a big Kurdish population, and was home to many ancient historic and religious sites such as the Tomb of Jonah. 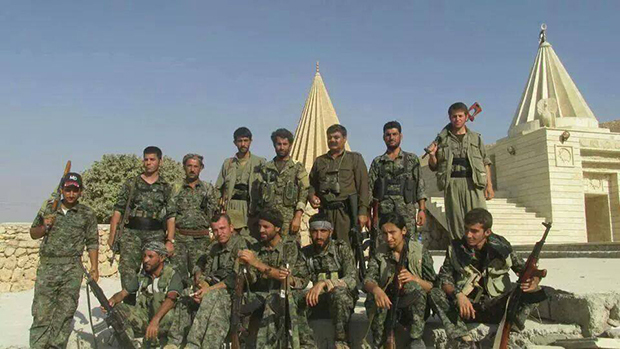 I assumed that the KDP and the local Kurdish Zebari tribe with some 10,000 armed men would not allow ISIS free rein. The media didn’t seem to be saying much about who was in control of East Mosul initially, but after a while it became clear that in fact ISIS were in fact being allowed free rein – first the Baghdad authorities complained that ISIS had stolen a large amount of uranium from a laboratory in the university; and soon after, ISIS blew up the Tomb of Jonah and several other monuments and shrines, severely punishing locals who protested when they saw explosives being rigged up around the tomb complex. Worse was to follow the inaction in Mosul, and it is not yet clear to outside observers whether the understanding between ISIS and the KDP continued, or broke down. The KDP systematically withdrew in front of ISIS – from various Christian / Assyrian and Turkmen towns in the plain of Nineveh / Mosul, plus Sinjar and the Kurdish town and refugee camp of Makhmur, leaving some new weapons for ISIS, just as the Iraqi army had done. It is pretty clear they were told from the top (Masud Barzani), not to fight, but to pull out. What we still don’t know is if the KDP were surprised or not by the attack on the towns of the Nineveh Plain and on Sinjar, but their retreat was certainly disgraceful, and I have read or seen many interviews with refugees, both from Sinjar and from places like the Christian town of Bartella, who complained that the KDP had promised to protect them, and even disarmed them saying they would not need weapons, and then pulled out just before ISIS arrived. Possibly the expectation was that the ISIS and Baathist forces were going to go straight down to Baghdad; which is still surrounded by a network of ISIS / Baathist activity, so the move on Baghdad could still happen. Or possibly the KDP were expecting the ISIS forces to move north to join the attacks on YPG, and south-east to attack PUK forces. Anyway, for days the mainstream media ran a story saying “the peshmerga” retreated; therefore there was “a question mark over the abilities of the famed peshmerga to take on ISIS”; therefore, US bombing and other “help” was required. This is still the dominant narrative. There was no mention of the fact that YPG had been defending Kobane in Syria against ISIS for 2 YEARS, that they and PKK came over into Iraq as soon as the crisis in Sinjar (which is near the Syrian border) began, and forced a corridor from Sinjar to Syria, through which many thousand Yezidis and others escaped; that the PUK peshmergas (from eastern South / Iraqi Kurdistan) had also been combatting ISIS reasonably successfully in parts of Diyala and had kept them out of Kirkuk and the surrounding area, and that PUK and YPG and PKK together have kicked ISIS out of Makhmur, and are co-operating in the area of Kirkuk. Apparently the KDP forces are now also participating in the fight against ISIS – no doubt with an eagle eye kept on them by the other Kurdish forces. The dramatic events in Northern Iraq have evidently afforded the US and Britain and other EU states a chance to meddle again in Iraq, this time entirely under the guise of the war on terror and lending a humanitarian hand. Actually, the fact that YPG (in the three autonomous cantons in Syria), FSA and Jabhat Al Akrad units (in a few towns in Syria and in parts of Aleppo), and YPG, PKK, PUK, have all held out against heavy ISIS attacks (as well as regime attacks in parts of Syria) shows that ISIS are not invincible. Probably the main American motives are to make sure that ISIS does not exceed certain limits, to try to consolidate a puppet Kurdish entity run through the KDP in order to defend US strategic and oil company interests in Kirkuk and elsewhere in Iraq, and to push Iran and the Shia-dominated government in Baghdad into some sort of submission, whether the US wants to see Iraq formally stay together, or not. There is much discussion of ISIS in the media, mainly focussing on its unpleasant nature rather than on investigation into how it is sponsored and by which states. This will only increase after the murder of the unfortunate American journalist John Foley. Some ink is also expended on the seemingly intractable problems of Iraq generally. For socialists or humanists, beyond condemning ISIS and more US and British war-mongering, the task is to see which forces in Syria and Iraq, and indeed the region, contain some emancipatory potential, and to support them. The present conflict and the plight of people in Northern Iraq, is bad enough, and although ISIS should not actually be too hard for the Kurdish forces to contain, if there are no more tricks played by the KDP, the US (and maybe Britain) seems already to be bombing more widely than frankly admitted, and it is not impossible that the war could widen and shift in scope and targets. The three most obvious targets beyond ISIS are the Syrian government, the self-declared autonomous majority Kurdish areas in Syria, and Iran. The conflicts in Northern Iraq are unlikely to be over quickly. YPG and PKK should be given every credit for their prompt action in Shangal, where they are still fighting ISIS and have helped Yezidis to set up self-defence units. It is also important that many more people take a look at what the Kurdish organisations have achieved in Syria, where ISIS is still attacking them and the FSA. The three self-declared autonomous cantons have been running themselves with a fair amount of popular participation, including by women, for some months. It is important to note that the Syrian organisations are close to PKK and have clearly been affected by the search for ways of increasing popular participation and local decision making that has taken place since Abdullah Ocalan, imprisoned leader of the PKK read and was impressed by the ideas of Murray Bookchin on grassroots organising and the need to save the ecology of the planet. This, together with long years of hard work, organisation and sacrifice is why the PYD (Party of Democratic Unity) and YPG (People’s Defence Forces) were able to take the initiative and launch the autonomous areas after the Syrian government had been embroiled with defending itself, and why the KDP, which has numerous organisations in Syria, have not been able to build anything of substance. The Kurdish movement in Turkey around the PKK was set back by the capture of Ocalan in 1998 but by no means defeated. At present there is a strong popular struggle against Turkish state efforts to build new military posts in Kurdistan, and the Kurdish politician Selahattin Demirtas stood as presidential candidate in this month’s election, and won a majority of the vote in Kurdistan, which shows that Erdogan’s wooing of Kurdish voters with promises of a solution to the Kurdish question and financial inducements (while backing the utterly reactionary ISIS killers in Syria and Iraq) has not paid off. Demirtas’s candidacy was a first for an openly Kurdish politician, and he stood for a broad party with progressive policies for all the oppressed in Turkey, with the usual electoral co-operation between the Kurdish legal wing and the Turkish far left organisations. The guerrillas are combating new Turkish army operations in several areas of Kurdistan in Turkey, as well as reinforcing the YPG in their difficult battle against ISIS in Kobanê, which still continues: evidently the Turkish army, in spite of its would-be apartheid wall along sections of the border between Syria and Turkey is not able to prevent fighters crossing. The fact that PKK has been able to sustain all this, and during August send people to Shengal and down from Qandil mountains into several parts of South Kurdistan to help the South Kurdish forces against ISIS shows that the organisation must be pretty strong. The PKK has had the reputation of being a fairly authoritarian and sectarian organisation, but they seem to be getting a lot of things right at the moment, which suggests that some lessons have been learnt over the years, otherwise it is hard to see how they could be in their present position. They have always maintained that while they wanted the liberation of Kurdish people, they were committed to international solidarity generally and to rights for minorities, and this is clearly one of their strengths in the present period. In Syria PYD has treated as normal the participation of other nationalities in the experiment of self-government, there is a mixed Arab-Kurdish force in Aleppo (Jabhat Al-Akrad/ Kurdish Front), and there is some co-operation with parts of the FSA, at least sometimes. Although the background of many Kurds in Turkey is Sunni, the Kurdish movement has always organised amongst the Alevis and promoted religious tolerance – towards the Alevis and other religious groups in Turkey. These principles have meant that it was naturally a moral and human imperative for YPG and PKK to act swiftly when disaster struck the Yezidis in Shangal, who are mainly Kurdish speaking but have pre-Islamic elements in their religion and have often been attacked by outsiders. YPG had also been issuing warnings about the ISIS threat for some time, including to the KDP, who they thought underestimated the dangers posed to the Kurdish entity in Northern Iraq by ISIS, so it was also a matter of political judgment. Here too, their judgement was proved right, unfortunately, and whatever the reasons, the KDP by its complicity in Turkey’s machinations and its failure to face ISIS or to ask the rest of the Kurdish national movement for help in time, has allowed ISIS to kill at least many hundreds of people in Northern Iraq, to abduct large numbers of Yezidi women, and to turn upside down the lives of several hundred thousand more people. In this situation, we should support the demands made by the Joint Diplomatic Committee of Kurdistan Organisations on 17 August (from a meeting including representatives of the Syrian Kurds, the Kurds of Turkey, the PUK, and two Southern Kurdish Islamic parties), for UN aid for the displaced persons, including in Rojava (Western Kurdistan), to which little or no UN aid has penetrated, an end to the siege of Rojava, the opening of UN offices in the region, condemnation of the countries which give support to ISIS, recognition that the attacks on Sinjar amount to genocide, and consequently for political support in the face of that genocide. The statement evaluated “the stance of the international community, in particular that of the western states and the United Nations, against ISIS attacks as positive”, though without commenting on the US air strikes. We should also take the opportunity to call for the removal of the PKK from the British and US terror list, since the US have found themselves obliged to work with YPG and PKK on the ground in Shengal and no doubt elsewhere. There is a bit of a debate on the left about whether to support the sending of arms for the Kurds. My view is that the question of arms is not critical – as explained above, determined and competent forces can deal with ISIS, though it is not easy, and the Kurds are not unarmed. I think it is more important to uncover and break the roots of the support for ISIS. In any case, the US and others are currently rushing to supply weapons to the Kurdish forces – though we should be on the alert to protest if it seems that far more are going to the KDP than to YPG, PKK or PUK forces, because there is certainly a risk that if the wind changes, the west could encourage the KDP to use the new weapons against their rivals. Clearly the people of Northern Iraq, including obviously the Yezidis, the Christians, the Turkmen, the Shia, and any Sunni who are not happy with ISIS, are entitled to get weapons to defend themselves against ISIS if they want to, and we should not oppose their obtaining them from wherever they can. The question should certainly be asked why the two big Southern Kurdish parties, the KDP and PUK did not manage to acquire more weapons for defence of the area and the peoples over the last 23 years – the KRG has not been short of money, frankly, and it is hard to understand why they did not buy suitable on the open market, if the US affected to wish only to supply the Iraqi government. Another positive point for the Kurdish liberation struggle is that Kurds from all four main parts of Kurdistan have been fighting together against ISIS (Iranian Kurdish fighters have also joined the battle), which gives the chance for people to mix and break down some of the barriers. We should not be complacent about the situation however. Whatever US motives for getting involved in the battle against ISIS and the defence of Erbil, the US does not want to see a strong independent Kurdistan thronged with guerrillas concerned with social justice and stopping the destruction of the ecology, so it is vital socialists do what we can to support such forces. We should also support the rights of the displaced people of Sinjar and Mosul and the plain of Nineveh to rebuild their lives, whether by leaving Iraq or by removing ISIS from their midst. There have been a few reports of resistance to ISIS, from women doctors in the hospitals of Mosul, to tribes who do not like the new dispensation, and we should also seek ways of supporting their struggles without falling into compliance with the current US and British governments’ agenda of using the advance of ISIS to manipulate the political situation both in Iraq and at home. The question of how ISIS ambitions towards Baghdad will turn out is a major question, but cannot be addressed here. ISIS in Iraq and Syria seems to contain several political trends; in Iraq some of the leaders are probably Baathists using militant jihadism opportunistically as a recruitment and fighting tool. In some places they seem to be working with other Baathist and Sunni tribal forces. But media reports usually do not distinguish between these elements, so it is often not feasible to differentiate between them when referring to their activities In terms of personnel, total numbers are not clear, but certainly several thousand, and including mercenaries and jihadis from many parts of the world, including substantial numbers from EU states. There is no doubt that ISIS forces are utterly reactionary. Even in western Mosul, a city with widespread support for the Baathists, and where Maliki’s sectarian Shia security forces took plenty of revenge for crimes committed under Saddam Hussein, the ISIS honeymoon is over; and to those who situate ISIS in a context of Sunni paranoia and despair and feeling of victimisation, which narrative sometimes becomes an excuse, we should point out that oppression doesn’t automatically make people behave better or worse – it depends on the conclusions they draw from it. We support people who understand oppression and then use it to try to liberate themselves and other people, not people who use it as an excuse to damage more people. In terms of sponsorship, much ISIS activity is clearly supported by Turkey; one could compare this to Turkey’s creation and use of Hizbollah / contra-guerrillas in the 90s. Many commentators believe that Saudi Arabia and Qatar (or some of their “rich individuals”) assist some of the groups. What the real relationship of US and Britain (as opposed to the public attitude) is to these three close allies’ sponsorship of ISIS is not yet clear; they have run many dirty wars in the last 60 years, including the fomentation of sectarianism in Iraq since 2003. Playing off national groups against each other is a familiar tactic of US and British statecraft, employed in the region for example at the time of the Iran-Iraq war. Obviously disgruntled Iraqi and Syrian Sunnis form the base for the IS setting up shop in south-west Syria and north-west Iraq, but that location is also excellently suited for putting pressure on all other states in the area: on the pro-Shia government of Iraq, Iran, Syria, an emergent Kurdish entity, (if its political complexion were wrong), even on Jordan or Saudi Arabia. The area ISIS is trying to control also matches “Sunnistan” on the American military “Peters Map” (published in the Armed Forces Journal in June 2006 ), and one obvious interpretation of the rise of ISIS is that it is partly a reflection of US plans to redraw the map of the Middle East. Some commentators think there is evidence for some Syrian state involvement, as a way of rolling up the genuine opposition. One account I read said, perhaps with some merit: “Everyone has their own ISIS”. The role of ISIS in Syria has been much discussed, and it has often been noted that it frequently spends more time attacking “fellow” oppositionists rather than the Syrian army. There seems to be plenty of evidence that the Turkish state and Masud Barzani have been helping it against YPG in Syria (Barzani doesn’t like rival groups that have aspirations to social justice and independence of the powers that be, to put it at its lowest). We should be aware that US officials regard the KDP as a counterweight to the potentially less pliable PUK (for example in 1996 during the war between the 2 parties, the US gave the KDP the green light to ask the Baathists in Baghdad to invade Kurdistan, which they obligingly did, thus stemming and reversing a successful PUK thrust into the Barzani area), and that they are pretty much pledged, unsuccessfully so far, to the destruction of the PKK. One imagines they do not view the three self-declared autonomous Kurdish majority regions in Syria with enthusiasm, and certainly US ally Turkey does not. So there is the potential, if not perhaps the beginning yet, of a war within the wars in Iraq – KDP and its allies against YPG, PKK and PUK. There is probably a truce on this in Iraq at the moment, probably not in the war on Kobane in Syrian Kurdistan; but we should be aware of this possibility for the future, especially as one of the outcomes of the present war in Iraq may well be more independence from the centre, up to separation, for Kurdistan, so the question of who has most power in Kurdistan is not going to go away and could become very sharp, while the situation in Turkey will probably also sharpen in my view over the medium term – the Turkish army has started a lot of new operations, presumably hoping to tie down PKK forces and weaken them on many fronts, but Erdogan will face plenty of resistance from the Kurdish / leftist/ post-Gezi movements.